You have selected the Club Car membership level. Club Car Memberships are a great way to save a lot of money and get free content while doing it. These memberships are packed with features and are perfect if you plan on buying several items of the course of a year. Membership last for 1 year and are subscription based. 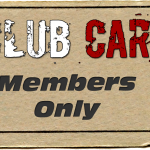 You get access to all the free content available to Club Car Members, right now it's approaching close to 40 items! All of the features are listed below. Special sale rates up to 50% off. 25% Discount all year long storewide.